Then Jesus was led out into the wilderness by the Holy Spirit to be tempted there by the Devil. I have set this scene at mid day, with the hot sun high in the sky. The sun provides the lighting for this scene, from overhead. 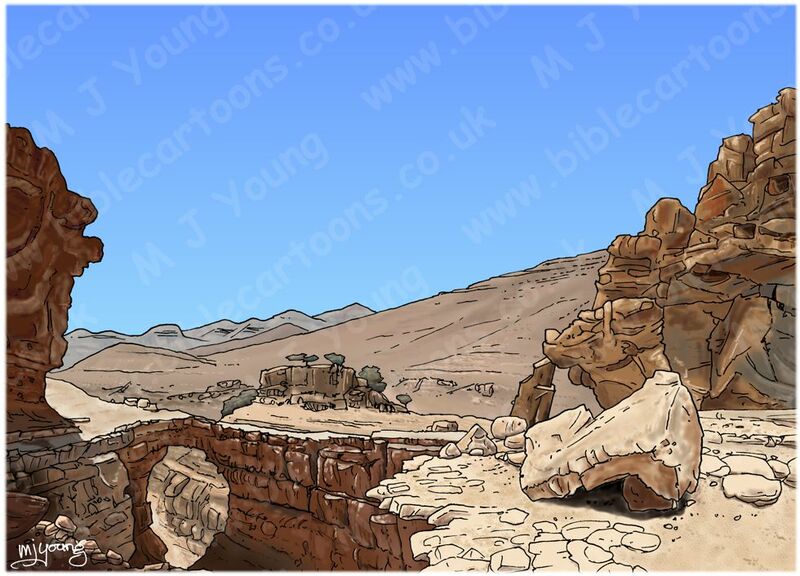 Since the Judean wilderness is a hot, arid desert I have used warm browns, oranges & greys to depict this scene. You can also see some sunlight reflected back off the rocks into some of the shadows, warming their colours. Jesus the Christ, the small figure in blue walking across the natural rock arch. This scene is based on two photographs I found of the Judean wilderness. I liked the natural rock arch, presumably cut by a stream running in the gully below it. I decided to keep the sky clear of clouds, to accentuate the heat of the sun & the aridity of this desert scene. I didn’t want anything to detract from the rocks & lizard either, & so I kept the background fairly simple in design. 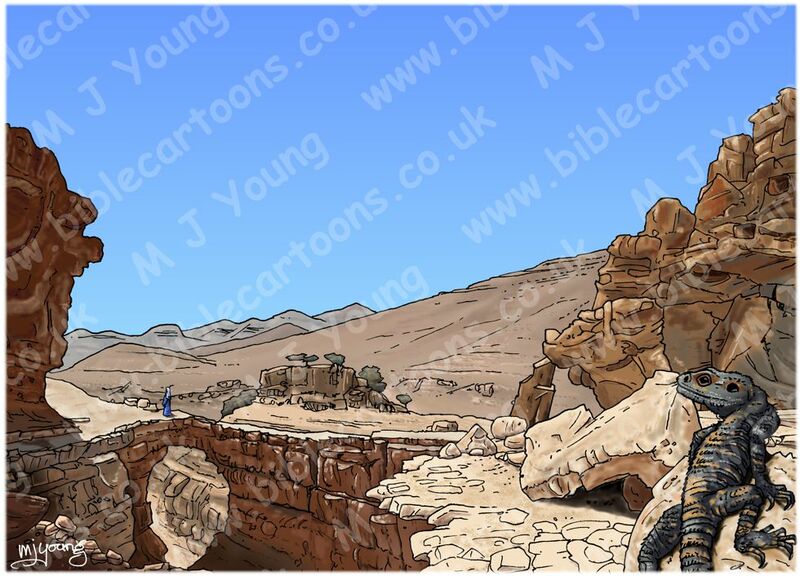 I have made the figure of Jesus very small in this scene to show the vastness of the desert he was walking in, & to highlight his isolation from human contact, during this temptation period. The lizard on the bottom right of the scene is a Southern Roughtail Rock Agama (also known as a Giant Painted Agama (Laudakia stellio brachydactyla.) Stellio also means Hardim or star lizard. Adult lizards are typically 8-12” (20-30cm) in length. It looks larger in this picture because it’s up close! Both sexes, but expecially the male, can change colour as a result of mood change or excitement. These lizards are quite timid in the wild, prefering to live in stone walls or among rocks. They enjoy basking in the sunshine on stone walls, rocks, buildings and also on trees. Here’s the scene without the figure and lizard.